The Chinglish Files by olr: So sick of censorship. For whatever reason, I had a hard time uploading pictures in recent weeks. Back to normal now, but still, so looking forward to the day, when China realizes censoring the internet is among the stupidest things to do on Earth (including even discussing an Alaskan vice-presidency and filing German tax reports). 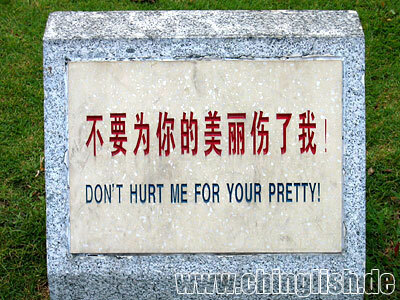 So, for today, I leave you with this beauty from Guangzhou. May it serve the purpose of reminding the Middle Kingdom's cyber watchdogs to go out and have a picnic in the sun (Guangzhou 25 degrees Celsius!) instead of sniffing around online. Many thanks, as always, Patricia. love your blog. one day ppl will realize the importance of recording these Chinglishes. so u r now in Guangzhou? After reading your articles and the interview, I am pretty impressed by what you are doing,and of course lah, your linguistic talents. As a Chinese myself, English is my second language, and I know this facts apply to you as well. And both of us have undergone a very painful process in learning a new language other than our mother tongue. Like, you are learning Chinese and I am learning English. So I guess it was because of this painful process that makes you very different from the majority of other English speaking people especially those native speakers, and have such a unique insights of the massive English learning populace in China. I really appreciated! You know, I picked up my English skill while I was studying in Singapore. And I was completely considered to be illiterated in English when I first arrived. And certainly, I've experinced ostracising,marginalizing by the local. And that's Singapore, an Asian country with 70% of its population are Chinese. I did not dare to imagine what was going to happen if I was in some Euopean countries or North American. After writing all these craps, hopefully it won't be too dry for you. I just want to let you know I really appreciate of what you are doing and also give you a "Big Thanks" on behalf of millions of people who are struggling in learning English. You gave them a place to find hope,encouragement by showing your empathy to them! Thank you! BTW: I presume to ask for your contact information like MSN or Skype. Coz I know you've also spent sometimes in Singapore before. And I think there are plenty of things that I could learn from you, and also we could share our experiences in learning language, culture, and also our lives as being a foreigner etc. Currently I am in Toronto. Just in case: chaukimnarm@hotmail.com this is my private email address. Look forward to chat with you. It seems that engrish.com decided to use the same signage as you have, about three weeks after you posted yours. They didn't use the same exact picture though.